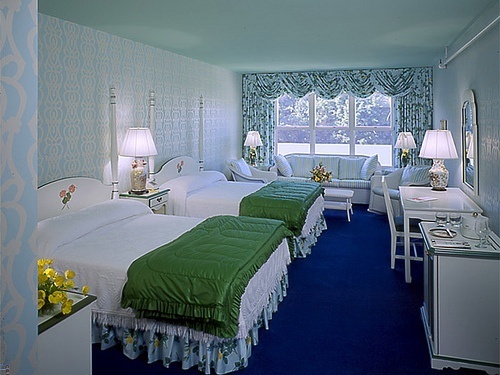 This Mackinac Island hotel was placed on Travel + Leisure‘s Best Hotels in the World in both 2008 and 2009. It is a landmark on this “no cars” island in the Mackinac Straits. Built in 1887, the Grand Hotel has 385 rooms decorated by New York designer Carleton Varney, no two of which are the same. A 660-foot front porch that is the world’s largest. 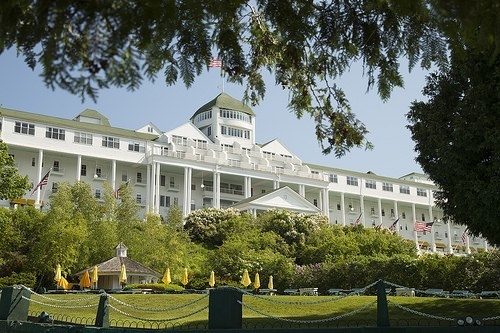 In 1980, the movie Somewhere in Time was filmed on location at The Grand Hotel on Mackinac Island. Breakfast and dinner are included daily in most guest room rates. All children under 11 years and younger stay and eat free. The Grand Hotel experience includes dressing for dinner. Evening wear is required in all areas of the hotel: coat and tie for gentlemen, and dresses or pantsuits for ladies. The Grand Hotel has views of the Mackinac Bridge and sits close to Fort Mackinac, carriage tours, bicycling and other Mackinac Island attractions. 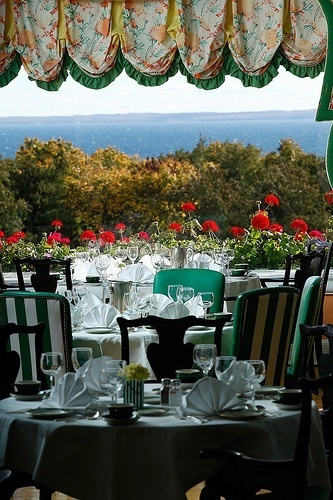 NEW FOR 2016: This iconic Victorian-era resort perched on a bluff overlooking the Straits of Mackinac sets an elegant backdrop for memorable meetings. The two-story, 16,000-square-foot Woodfill Conference Center has space for up to 800 attendees, with smaller rooms nearby for breakout sessions or smaller groups. New for 2016: Sushi Grand, a made-to-order sushi restaurant next to the hotel’s Gate House; an upgraded business center with state-of-the-art facilities; 400 new meeting-room chairs for more comfortable conferences, and more. After-work activities include horse-drawn carriage rides, bicycle trips, and golf at the Grand’s 18-hole Jewel course, with nine holes near the water and nine in the woods. The stage is set for an historic 2019 for Grand Hotel! The final stage of the historic resort’s long-awaited Cupola Suites project is underway–creating incredible interior guest spaces and restoring the original 1887 roofline. Begun in 2014, the Cupola Suites project will restore Grand Hotel’s original striking roofline from the late 1800s with a row of 24 dormers lining the entire roof. The project includes adding four new Cupola Suites in 2019, bringing the hotel’s guest room total to 397—and making a total of 9 Cupola Suites. These unique accommodations offer flexibility of One-Bedroom or Two-Bedroom options with a Parlor, ideal for families or anyone needing extra space. The project began on the west end in 2014 with the Musser Suite followed by two new Cupola Suites in 2015, and three suites on the east end in 2017. Grand Hotel is now accepting reservations for the 2019 season.